I don't know how many times Chen had gone to China. She has a former colleague who loves China very much and almost married to a Chinese in China. 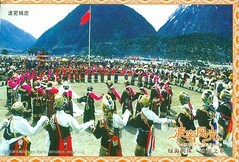 This time she sent me the postcard from Lhasa. She saw a lot of cyclists on the road. China seems a good place for travel. Lin and I went to the same university. But we did not know each other untill 2006. I met her in Canberra, Australia, where the name of the place means 'meeting place' in Australian Aboriginals' language. She was the student in college of management and joined the financial world after graduated. She went to Switzerland for a training program and met a guy comes from the school in Australia which I studied in. 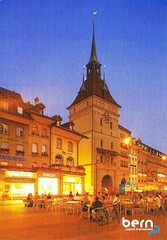 I think Switzerland is a country that people meet here very peacefully. Hokkaido is a place not like Kansai where contains so much traditional culture. I have little impression of it but Sapporo Snow Festival. CHEN went a tour on cycle with bicycle members. Hokkaido does not sound like a place for grand tour to me. But it a good opportunity to expand their view. 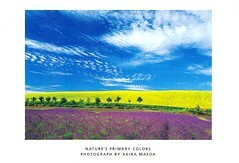 The lavender field and the white clouds are colourful. There must be some big cities in Hokkaido, but the impression of Hokkaido must be countryside to most of Japanese. Ambiru went for the world tea expo in Atlanta. 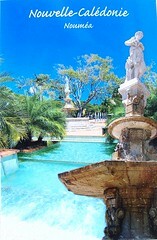 She stayed in the hotel in the postcard. This building is the CNN center, world headquarters of the Cable News Network. 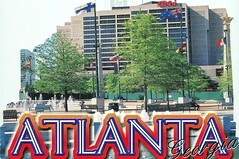 Atlanta is the capital of Georgia and a city in the south. I have not been there. 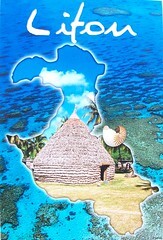 But from Ambiru's description and some readings like Gone with the Wind, I think it must be a very traditional city. There is only one sentence in the left postcard. 'Hello. I am at Qinghai Lake, feeling cold, and it is raining.' What a good expression. Short but strong. Japan was not a travel destination to me but other people. Mao planned to go to Kansai during her busy study. I ordered a geisha postcard and she made it. 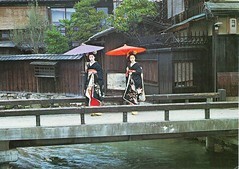 Japanese traditional culture is fascinating. If I had the chance to go to Japan, I would go to Kansai first. 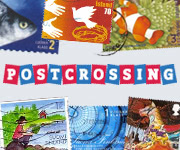 Postcards with postage sold by the post office are usually the cheapest you can find. 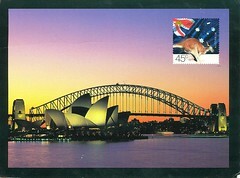 I only bought this one in Australian post office. 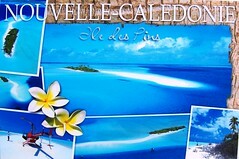 I decided to use it when I was in Lifou, New Caledonia and posted it on the last day in Australia. It made me feel I was still in Sydney after I have came back to Taiwan for a week. But a few weeks later, It changed to remind me I was not in Sydney anymore. Goodbye Sydney. I used an international trip to end up my one year Australia stay. I do not know was it a good idea or not. 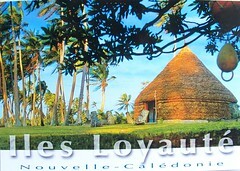 Because these French Pacific islands were so great. I had a very good time there. The blue sky and sea were stunning and very impressive. Maybe too impressive, and made me have less Australia memory now. Look at all these blue postcards. Are they like paradise? Most of exchage students in Australia go to New Zealand, Fiji, or Indonesia for international travel. 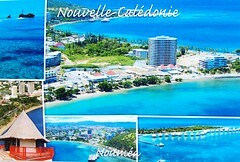 I made a different decision, New Caledonia. 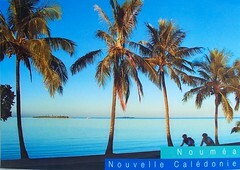 I checked the tourism statistics of New Caledonia 2005. There were only 16 people holding Taiwanese passport visiting NC. It sounded like a secret place on Earth to Taiwanese. When I saw the scenery, I realised there is a place postcard-like. 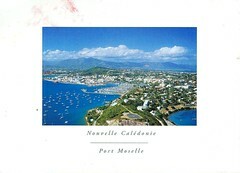 I could not upload my pictures to share with friends, so I sent them postcards. I was also afraid of my bad photography skill, so I took pictures of those postcards. Here are them.